The stunning stainless steel Aterno water feature from AQUA MODA consists of a highly polished sphere 2000mm in diameter to be positioned in a pond or on a pebble pool. The elegant Aterno water feature has been carefully handmade by skilled craftsmen for AQUA MODA. The Aterno large spheres have been used in larger garden designs, hotel grounds, School quads, housing developments, town centre management projects and even for the Welsh Ryder Cup! The Aqua Moda Aterno is the trusted brand in stainless steel spheres and has been shipped internationally, for our worldwide customers. If you are outside the UK we can ship anywhere in the world. Please email or call for further details and a price. 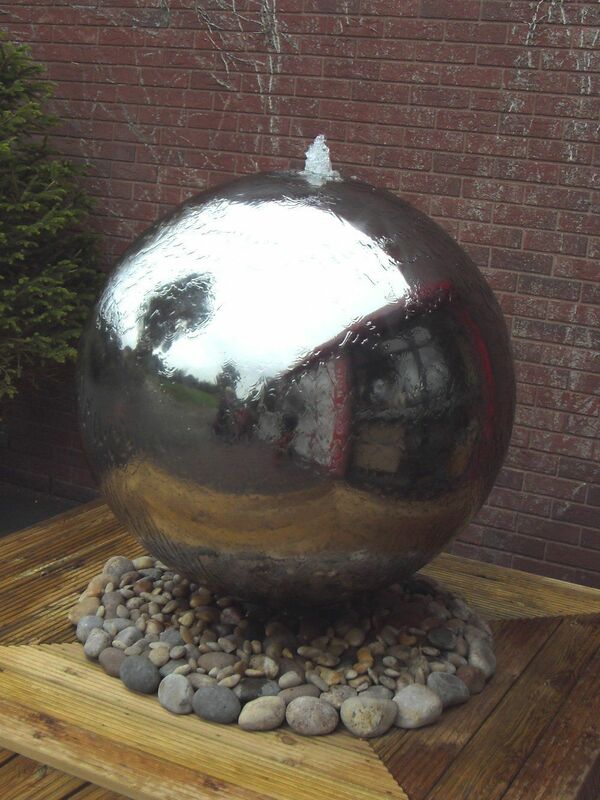 6ft 6.8 ins (200cm / 2m) diameter polished stainless steel sphere. Please contact us by phone (0161 3203000) or email for further information; including detailed installation guides, written quotations and specifications. "Product installed at Redcar College. Very pleased with sphere. Additional photos available from college website cleveland.ac.uk"